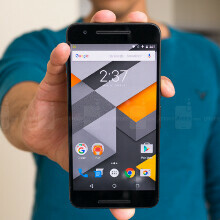 The Google Nexus 6P was one of last year's great smartphone success stories. Built by Huawei, the device packs a strong array of tech. specs including the Snapdragon 810 SoC and 3 GB of RAM, capped by a superb rear-facing camera. Even though it was only rolled out in November, it doesn't take long for modern-day smartphones to begin feeling their age, and already, the 6P has a slew of strong, Snapdragon 820-powered rivals for company. 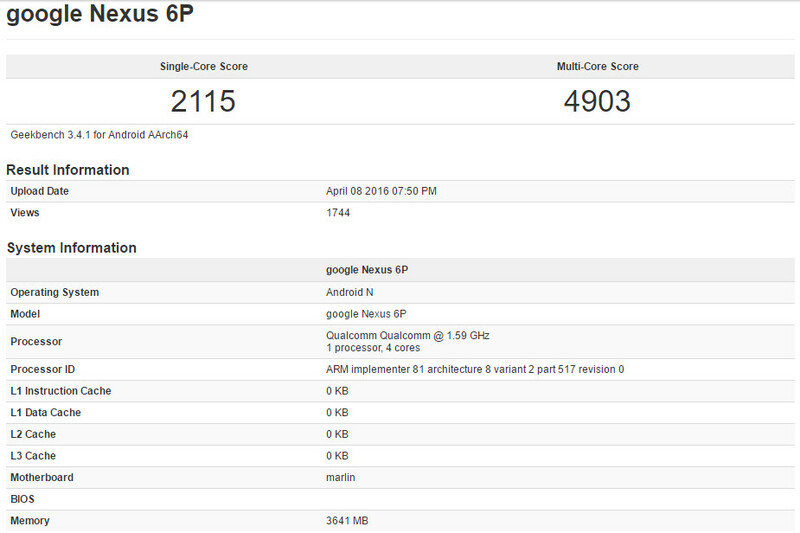 In a real turn up for the books, though, a seemingly new variant of the Nexus 6P has been caught on Geekbench with the Snapdragon 820, 4 GB of RAM and Android N in tow. Though it seems that HTC may take the reigns for this year's fleet of Nexus devices, this doesn't necessarily mean that the Nexus 6P won't get a successor, or at least a refresh. With HTC said to have penned a long-term deal to oversee the creation of Nexus devices over the next few years, it was looking like Huawei's recent '7P' trademark would be the only hope of the Nexus 6P's continuation. But with these specs having checked in through Geekbench, we may not have seen the last of the handset's legacy. As you'll see above, the device includes the quad-core Snapdragon 820 clocked 1.59 GHz, flanked by Adreno 530 graphics and 4 gigs of RAM. Interestingly, the motherboard section references 'Marlin'—the same moniker attached to one of the upcoming Nexus handsets. It seems possible, then, that an upgraded Nexus 6P running Android N could be in the offing for later this year, though this theory places some doubt on the notion that HTC will man the Nexus fort exclusively. Regardless of how the Big G plans to assemble its manufacturing partners, we certainly would not balk at a new-and-improved take on the Nexus 6P. The phablet is unquestionably one of the best of its kind on the market right now, with its array of strong specs packed into a premium, metallic housing. Needless to say, we'd welcome more of the same with open arms. Would you like to see a new version of the Nexus 6P roll out this year? Let us know in the comments. The 6P has just an okay sensor. The thing superb here is the HDR+ mode of Google. I wish every phone is capable of HDR+. It has a better than okay sensor but yea the HDR+ is amazing. The camera sensors are great on the Nexus 6P. It allows for more light to be captured 1.55um pixels, plus it supports 240 fps for slow motion. Putting that aside. This has to be wrong because why would they clock the SD 820 down to 1.6 ghz, especially when the 820 is rated for 2.1ghz with DDR4 clocked at 1866mhz ram. It makes no sense to under clock it that much. It might be a SD 818. The HDR+ mode for the 5, 6, 5X and 6P have all been great. Ok, this might piss me off. EDIT: i hope this is false. I think this is false. Why would any OEM use a SD 820 and then under clock it that much. The SD 820 is rated for 2.1ghz with DDR4 ram clocked at a max rate of 1866mhz (29.8 gb/s). I wonder if the SD820 in a 6P chassis would require underclocking. Obviously not 1.6GHz underclocking, but underclocking none the less. This year's vendors seem to be doing all sorts of fun tricks (heat pipes anyone?) to dissipate heat which requires design work up front. Unless the 6P already had heat dissipation designed in for the SD810, I don't think they could just take a SD820 off the shelf and shove it in there at full clock speed. What would the battery life look like? I like the 6P. It would.be retty amazing considering 6P battery is good and the S810 was a battery hog. Not Exynos S7 edge great but still great. Nexus 6P battery life was similar to the Galaxy S6 even with the larger battery because SN810 was a battery hog. Average battery life for a phone with a 3450 mAh battery is pretty bad. i hope that this one will go public if it's true, not like the Nexus 5 with fingerprint scanner only for google devs. I was going to wait until the next Nexus phone to release and hold on to my Turbo. However, if this is true, my Turbo will be retired effective immediately. A bump to 820 from 810 won't cause anyone to buy the phone! The 6P is great as it is... I for one wouldn't upgrade just for the 820 chip and 1gig of extra RAM... Maybe the next nexus(2017)!